Progress Reports will be sent home Wednesday, December 30. Please review, sign, and return them ASAP to your homeroom teacher. Please note that the end of the term is quickly approaching. All second term work must be submitted by Tuesday, December 20th to earn a grade. I do not take off points for late assignments, but you will earn a zero on anything that is not handed in by the time you leave for holiday break. Greetings from sunny Miami, Florida! I'm making the most of my Thanksgiving break by spending as much time as possible on the beach! I hope you are enjoying your time off, too! There is a lot in store as we start the first few days of December! I've updated the classroom calendar to reflect all upcoming assignments and tests. You can get to it by clicking on the "calendar" tab above, or by simply logging onto your Google account (it is synced to your Google Calendar). As usual, you will have homework Monday and Tuesday evening to complete. Your lessons, TenMarks requirement (due Friday), and Google Classroom journal (due Friday) will help you prepare for a quiz on solving equations Thursday. If you'd like some more practice solving equations, check out the following sheets. The answers to the problems can also be found in the document. Last week's super moon brought with it some high tides to the Savannah area. High tides were also seen in many other places, too! 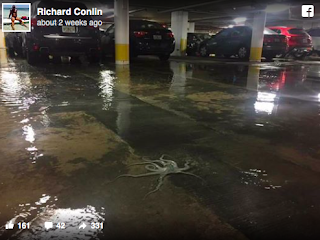 Here in Miami Beach, the high tide stranded an octopus in a parking garage that flooded! Our science studies over the next two weeks will focus on tides! We will research what causes them to happen, the different types of tides, and how tides range in height at different times and places. Use the following vocab. words and study guide to help you prepare for your test this Friday (vocabulary) and next Friday (final). To help guide your research, please complete the following choice sheet by next Friday. While doing so, continue to reflect on those things in your life for which you are Thankful! Take advantage of the rest of your holiday break! I'll see you again Monday morning! There's so much to be thankful for in our classroom this week! I'm happy to spend each day learning about our amazing world with you! Let's make the most of our last two days together before our Thanksgiving break! 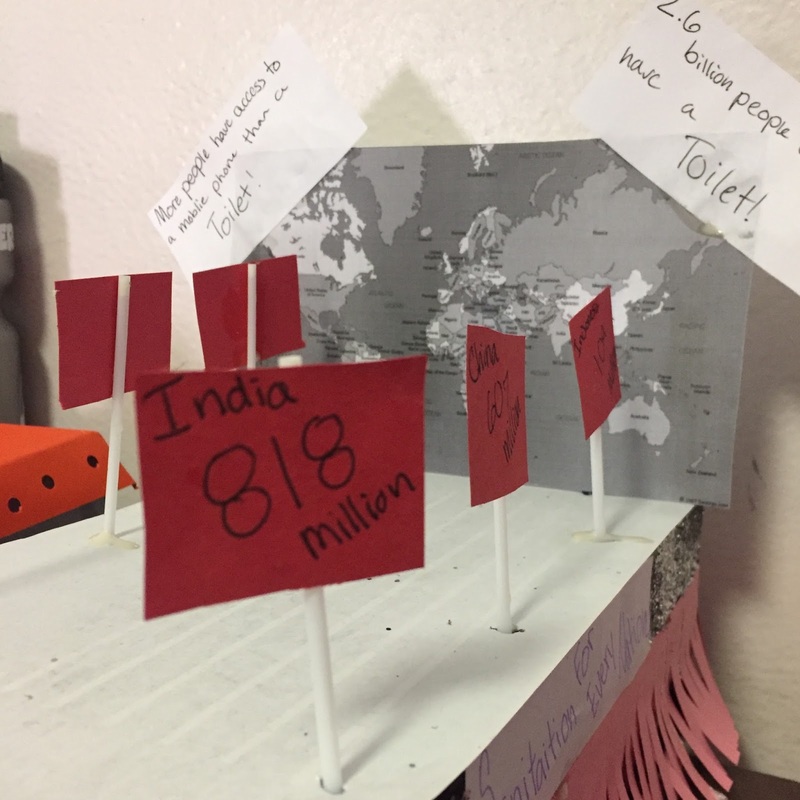 Most of us have the luxury of celebrating World Toilet Day by having an actual toilet to use, but for 2.5 billion people in the world, toilets are yet to be a part of their lives. 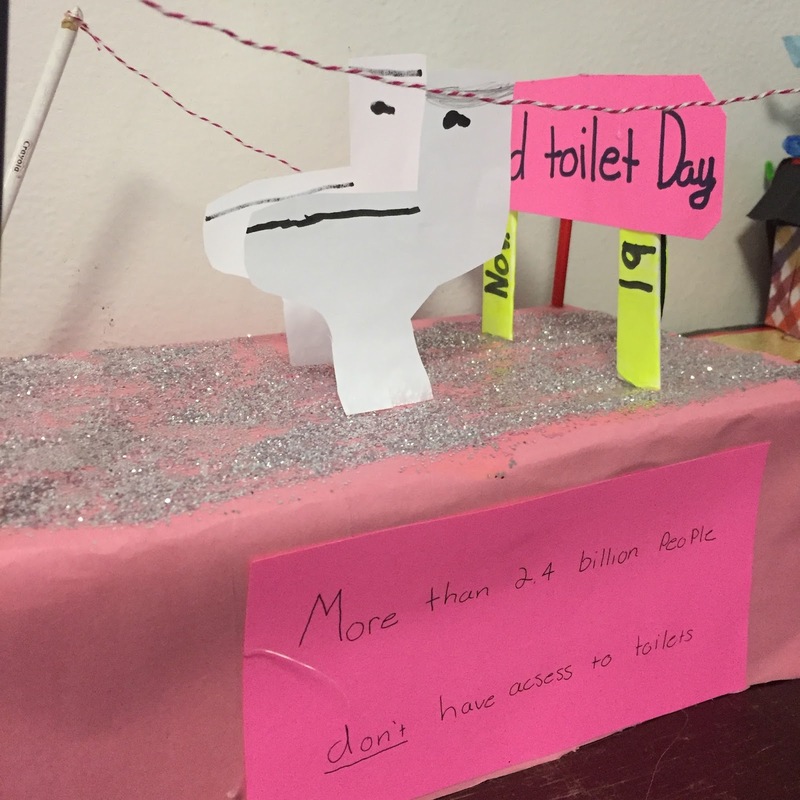 World Toilet Day is marked each year on November 19th and aims to raise awareness about the fact that 1 in 3 people in our world do not have access to a basic toilet and to encourage policies that increase sanitation especially for the world’s poorest people. 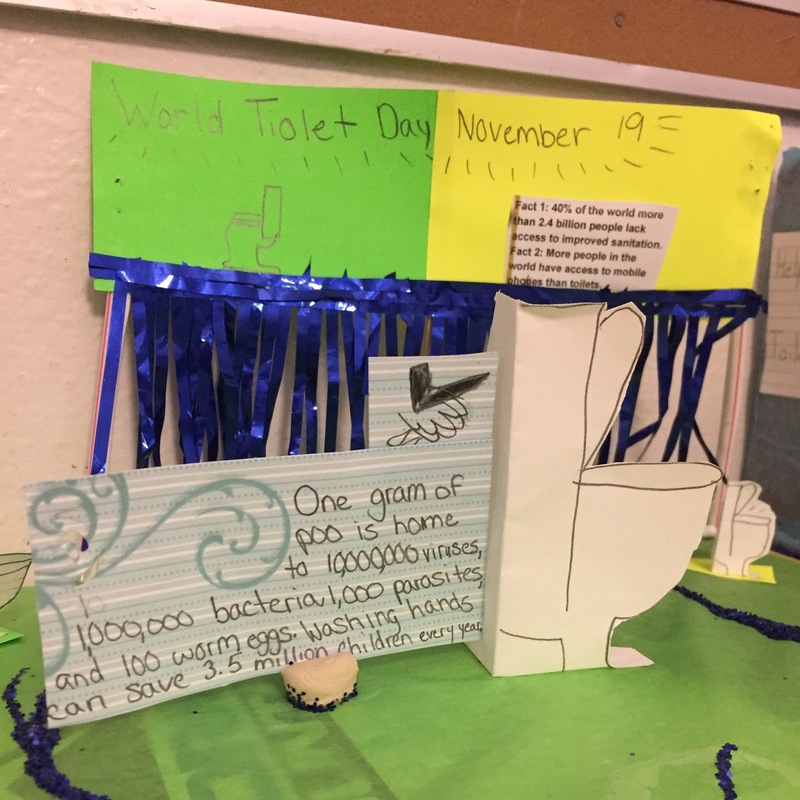 We will celebrate World Toilet Day and spread the word about the need for sanitation for all by creating World Toilet Day floats for the Macy's Thanksgiving Day Parade! Please bring in a shoebox and any other supplies you wish to use from home for your creation. Your finished float is due before you leave for holiday break. Use the following rubric as you create your float. On another note, we will have our annual evacuation drill Tuesday morning. Please bring in a shoebox by Monday, November 21. We will be using them for a fun art project next week! Friday is a dress-down day! Bring in $1.00 to patients. All money will be donated to "Pennies for Patients." Since 1994, millions of dollars have been raised in pennies and other spare change by more than 10 million elementary, middle and high school students throughout the country. 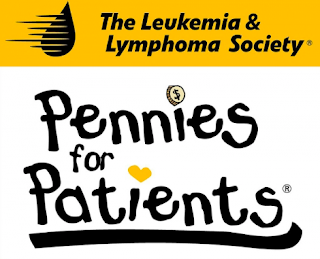 The funds, collected during a three-week period, benefit The Leukemia & Lymphoma Society. Tomorrow, Wednesday November 16th is the first day of math tutorial. Tutorial is invite-only, so please take advantage of this opportunity if you've recieved the paperwork to do so. We will begin at 3:00 and end at 4:00. Please arrange for pick-up from Ellis by 4:05. This week is shaping up to be a good one! Our math studies will shift from ratios/proportions to some algebra work. Our science work will involve research into where water is found on our planet. You will have homework Monday and Tuesday evening, as well as a quiz Thursday. Please complete your weekly TenMarks assignment by Friday. You will NOT have a journal this week. Are you up for a challenge to help you practice writing expressions? 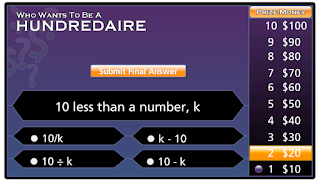 See if you can be a "hundredaire" in this game! We've been talking a lot about ocean over the past few weeks, but that's not where all of the water on Earth is located! This week, you will discover the many other places where water can be found on our beautiful planet. Use the following vocabulary list to study for your quiz this Friday. The following choice sheet will guide you in your research this week. Please note that TWO choices are due this Friday (November 18). This is a departure from your routine of having two weeks to complete a choice sheet, but next week is truncated because of Thanksgiving break. There will be no other test on Earth's water disruption other than your vocabulary quiz. I've updated the class calendar to reflect all work due this week. Please also pay close attention when we fill in our planners each day to write down all important due dates. Progress reports will be sent home today. Please review, sign, and return them to your homeroom teacher as soon as possible. Feel free to write any questions onto the reports that you may have. 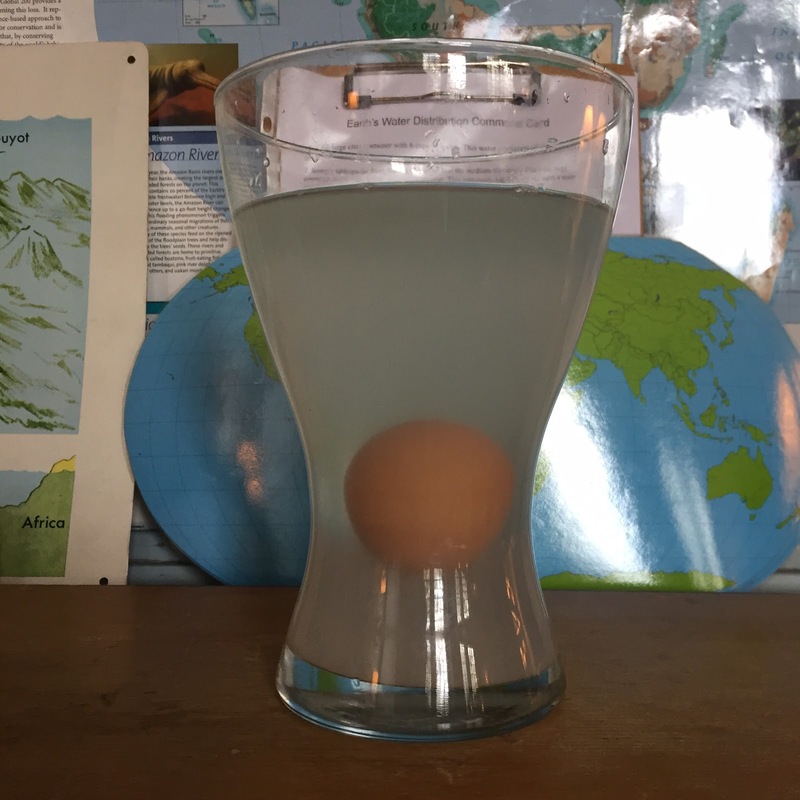 We used the power of salinity to suspend an egg in the middle of a glass container! The more dense salt water remained at the bottom of the container. The less dense pure water stayed on top. The egg (being more dense than the pure water and less dense than the salt water) floated between the two! Deep ocean currents form when salt water sinks to the bottom of the ocean, causing streams of water to occur well below the surface. It's a short week at Ellis...we will not have school Friday so we can celebrate Veterans' Day! Don't worry, we will fit a full week into the four days we are together. - What is 20% written as a fraction? - What is 15% of 30? - 45 is 10% of what number? - 10 is what % of 30? Understanding percents will be easier if you keep in mind what you learned about proportions. We will use the "part(is):whole(of)" proportion to unlock the secrets of percents. You will have homework Monday and Tuesday. Your TenMarks assignment will also give you an opportunity to think about percents. Please complete it by Thursday. You will NOT have a math quiz or journal this week. Please continue your research concerning currents and waves during work time this week. Your choice work is due Thursday. Your test on currents and waves will also take place Thursday. Use your study guide to prepare. Using a shoebox-sized model of an ocean, we recreated what happens when temperature changes effect the density of water. As warm water rises and cold water sinks, deep ocean currents are created. Differences in salinity can also cause the same phenomenon. 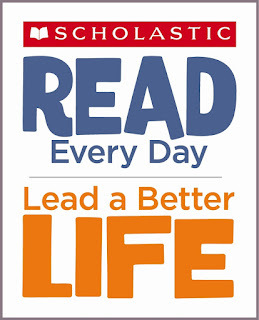 Attention Mr. Trent's Homeroom: The November Scholastic Book Club flyer has been delivered to your mailbox. Please place any orders online by Thursday, November 10. You can visit the order site by clicking HERE. A computer-generated representation of the oceans' surface currents is quite a work of art! Can you pick out some major surface currents found around the world?